What to do with RSS feeds? Posted byD Needlestone	 May 4, 2008 1 Comment on What to do with RSS feeds? Today I rely on RSS feeds to provide me with the information I want when I want. I can’t believe that a year ago I didn’t really know what the point of an RSS feed was. RSS is an acronym for really simple syndication, it provides automatically updated feeds from websites, blogs and news sites which can be imported and read using a range of applications on the internet or on your PC. To use RSS feeds on your VLE is pretty simple. On Moodle there are a couple of different RSS features. You can add RSS blocks to bring in external RSS feeds and you can add RSS funtionality to your site forums to allow others to subscribe to your feeds. It is the former that I use mostly because I’m still to work out how the second works especially with regard to privacy and security in schools (maybe a kind reader will explain the functionality to me). I’ve added three RSS feeds to our frontpage. 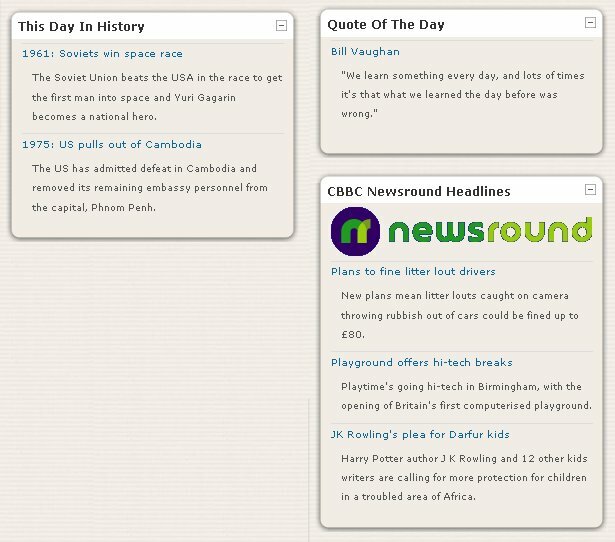 A quote of the day, news from CBBC Newsround (child friendly news headlines) and a “This Day in History” feed. Each provides a little bit of wisdom or knowledge in one hyperlinked line. You can set how many items appear in each feed and how much information you want displayed, just the headlines or more. (the picture below has been edited). I may well remove some in the future to avoid the homepage becoming too cluttered. You can also add RSS feeds in a block on a course page. For my A-level computing students I added links to Wired and Computing magazine newsfeeds to present a mix of internet and business ICT news. A colleague who teaches Chemistry added links to New Scientist and Chemistry World feeds and picked specific feeds related to energy. She then took it a step further by setting students a homework using the feeds to research a topical news item. A great use of RSS feeds and a great way to get students to read literature relating to the course and gain a wider understanding of the issues. Problems: One specific problem I have had is with graphics and in particular advertising on a particular feed. On Moodle you can choose to allow your feed to pull in graphics or not – graphics can sometimes mess up the layout of your site by stretching boxes and moving things around on a page. With one feed even when I turned graphics off it would sometimes pull in adverts from feedburner who provided the RSS subscription. Normally I would ditch a feed that put unsolicited adverts on a site but I really wanted this particular one so I found a rather elaborate way around it using yahoo pipes (ask if you want to know more – I don’t want to bore you with the details). Let me know how you use RSS feeds in your classroom and I’d also love to hear from anyone who has experience turning on the extra RSS functionality in Moodle. I’m still at the point of modelling for my kids to get them excited and involved. Whether I move on (I’m interviewing on 5/5 in Kittery Maine USA) or stay, I’ve promised the coordinator here or myself, if I go elsewher to be aggressive with RSS. Have you read the new ISTE book on RSS? It is excellent.